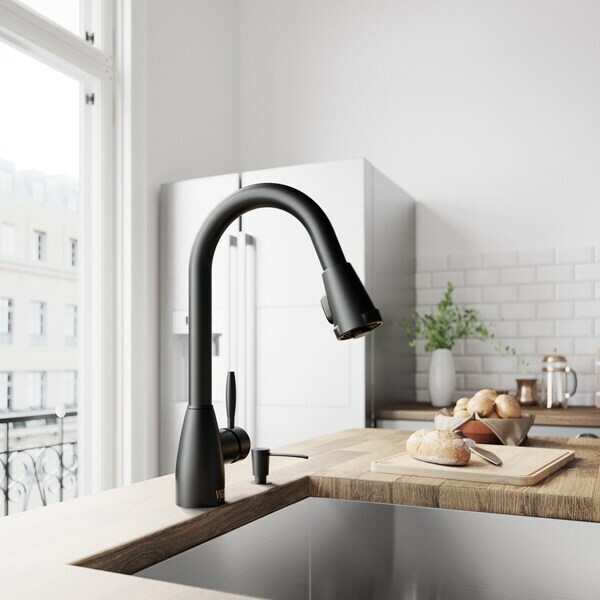 A dual action, pull-down spray head that swivels 360 degrees and a spout that's extendable up to 30 inches makes the VIGO Graham Pull-Down Spray Kitchen Faucet a smart, highly functional addition to any modern kitchen. Solid brass construction and a matte black finish resists corrosion and ensures longevity. Dimensions 8.63 In. X 2.63 In. X 16.0 In. I bought this on line because the price was about what we had decided to spend . It was for my son who was doing many improvements to his new home on a limited budget. We were so impressed with the quality of this faucet. My husband who has worked with plumbing his for 40 years said the product was worth at least double what we paid !!! Packaged beautifully and had the water lines with it which was a nice surprise . Would definitely recommend this to family or friends. Absolutely LOVE this faucet and the price was amazing as well. This faucet has preformed very well and love how tall it is. I can now fit big pots in the sink and they dont even come close to the height of the nozzle. It definitely its like a piece of art in out kitchen, so beautiful! Very happy with this vigo faucet! Also have one in the bathroom. Great quality. Easy to install! Love the finish! I was nervous going with a brand we didn’t know but so far so good with Vigo! 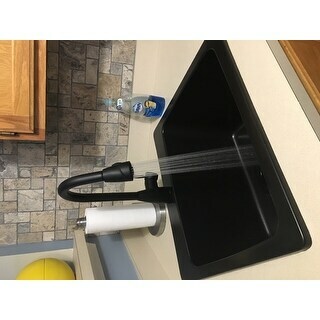 This faucet came and is everything I could have hoped Ford it’s nice quality and truly matte black with no weird oversized base. This neck is sleek and the pull out is nice. I have yet to install this faucet, as we are currently remodeling the kitchen. 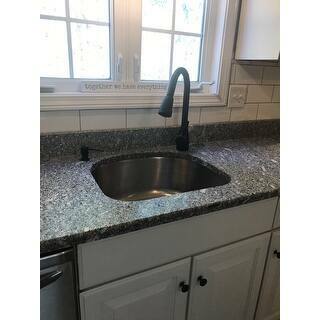 Love the black color and we are chomping at the bit to get the Lexicon quartz sink and this faucet installed. This is our second VIGO faucet...couldn’t be happier or more pleased with it’s appearance and functionality. Very high end look and feel...perfectly packaged and shipped...package could be dropped from a 10 story building and wouldn’t damage the faucet. ALL VIGO fixtures and sinks we’ve purchased were expertly packaged to prevent any damage. Exceedingly happy!! Super happy with this update. Solid construction, and easy (for a handyman) to install. Very well packaged! Perfect! Easy to install! Looks awesome in my new kitchen! I was a little nervous about purchasing this faucet, because I had never heard of the brand. But it was half the price of similar models I was seeing in stores. Just had it installed today. It looks GREAT! I asked the plumber what he thought of the quality. He told me that it is absolutely a well made faucet, and he never has trouble with them....... SCORE!!! I ordered this for our pool cabana bar area~ its perfect! 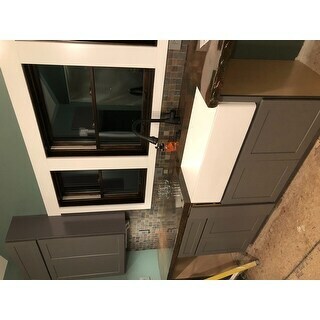 We wanted a more industrial look and it goes great with our concrete countertop. Great value and look. Works wonderfully and looks gorgeous. Love it. It ties in well with all of the other hardware and fixtures we have in our house. Was easy to install as well. Love my faucet. Looks great, great price. Way better than what you'd get at the big box stores. Packaging was super secure too. Although it is not installed yet, the faucet feels very sturdy and is beautiful! This is a nice look in back. The only issue is that the hose doesn't recoil. Easy to install. Works perfectly! "Does this faucet come with a plate to cover a separate sprayer hole?" Unfortunately, this particular faucet finish does not come with a deck plate. 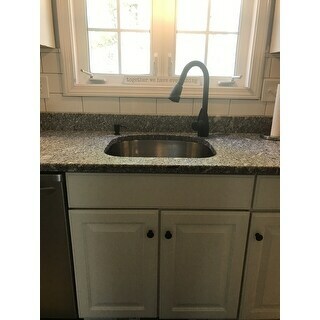 "What is next to faucet in picture? Is this a soap dispenser?" "Is this made in America? Does this have multi-spray options?" Hello langhorne, this item is manufactured in China. It features a dual function pull-down spray head for aerated flow or powerful spray. Thank you for shopping with us.